d2b International has joined salesforce.com’s partner program to be able to share our expertiese in international data management with salesforce.com’s customers. Our solutions have been certified to meet the same requirements as the salesforce application with respect to integrity, performance and security. Jobscience is the leading provider of HR and talent management applications on Force.com (a Platform-as-a-Service (PAAS) offering from salesforce.com) and for the past two years has received salesforce.com’s AppExchange Customer Choice Award for Recruiting. – Candidate Management: Quickly recruit, track and manage candidates using resume parsing and intelligent search. – Networking: Access social networks to leverage connections and collect candidate information. – Interview Management: Keep all participants involved and informed. Factory42 is helping mid-sized companies to realize the benefits of Cloud Computing solution, based on salesforce.com an Google Enterprise Apps. – Cloud Integration to e.g. SAP ERP Systems. Data Quality is key for the success of CRM projects, Factory42 deliver complete solutions including DataTrim implementations in salesforce.com. At Cloud Consulting we move your business, process and products painlessly into the Cloud. 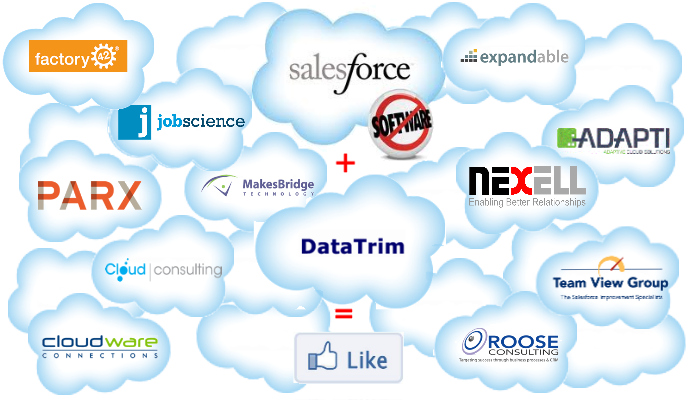 We are a Salesforce.com partner and our speciality is implementations for new adopters of Salesforce.com applications. We carry out strategic business consulting to help kick-start your transition into the Cloud. -We provide experienced professionals who can work with your company at the most senior level in order to carry out strategic reviews, define cost benefit cases and carry out all aspects of business process modelling and engineering. This is not ‘blue sky’ work but very practical and pragmatic engagements targeted at getting business change resolved quickly and effectively. -We provide business enabling technology to make it real. -We supply technical and business project resources to successfully manage and implement Cloud solutions. We work in all areas of customer relationship management, sales force automation and content and document management solutions. Additionally we develop bespoke Cloud applications. The San Diego CRM Consulting is a customer-focused consulting firm with a global client base and ‘Old School’ approach to customer service. PARX is one of the leading certified salesforce.com consulting partners in Germany, Switzerland and Austria. With experience from more than 150 salesforce.com projects and as a company using salesforce.com since 2000, we help our customers be more successful with salesforce.com and the force.com platform. We provide process analysis, specification, implementation, customization, integration, programming, support and training. Nexell specializes in the field of CRM (Customer Relationship Management). Our services, technologies and strategies culminates from years of experience with large and small firms, resulting in a set of best practices which are applied to all our projects, big and small, locally and internationally. Our team is experienced in international and local Sales, Marketing, Customer Service and Support, Senior Management, Industrial, Electrical and Internet Engineering and Software Development strategies. As a neutral and un-biased partner, our Customers trust us as their strategic CRM solutions provider for Salesforce.com, SugarCRM and vtigerCRM. The Black Iron Group is a boutique management consulting firm dedicated to the Retail and CRM sectors. With deep business and technology knowledge, we deliver superior design and implementation of strategy, technology, and process solutions.